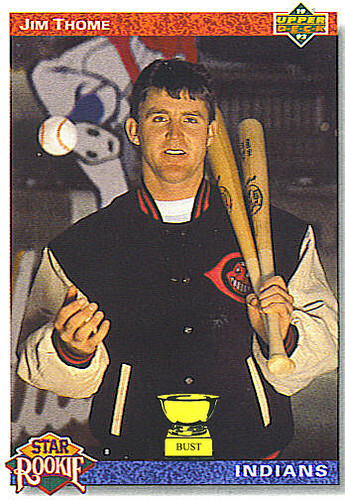 Welcome to the team: As a rookie prospect undergoing hazing in 1991, Jim Thome thought he was getting off easy when he was assigned to be a night watchman at Cleveland Stadium. It wasn't so bad at first; he got to wear his letterman's jacket when it was cold, and he was provided an unlimited number of bats and baseballs with which to bust the skulls of would-be ne'er-do-wells. But things turned ugly one June night when a group of eight drunken longshoremen turned up, asking for a meeting with struggling manager John McNamara. Thome, ever confident, told the men to take their show back to the Cuyahoga. The situation quickly escalated. Thome was forced to eat splinters from his own bats, was run over by the bullpen car and ended up bound and gagged aboard a garbage barge on Lake Erie. Hats off, Jim Thome! "Warriors... Come out and play..."